Wireless indoor hotel air quality data monitoring helps you oversee the health of your hotel and guests from anywhere at anytime. 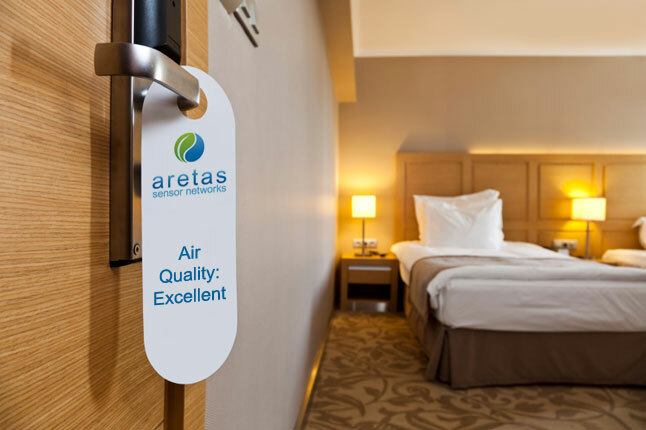 Aretas’ hotel data management system gives you the real time information you need to make important decisions about your hotel indoor air management. In a survey conducted by Opinion Research Corporation* 381 frequent travelers identified odors (68 percent of respondents) and "stuffiness" (59 percent of respondents) as being the most frequently encountered indoor air quality (IAQ) problems. Hotel indoor air quality monitoring is integral to the long term success of any hotel or resort. Get real-time data relating to potential energy savings, poor air quality, optimal conditions to prevent mold growth and even protect health and safety. 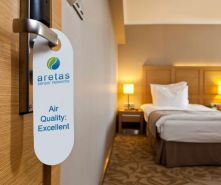 Aretas supplies you with the data you need to make key indoor air quality decisions 24/7 at any of you locations worldwide. Monitoring your hotel air quality allows you also improve your public relations. Post your monitoring efforts to your website, respond to negative (and positive) reviews with action you are taking. In February 2014 CBS News released a story titled "Deadly" carbon monoxide levels at Baltimore area hotel that shows CO is a real-world concern. * Frequent Travelers Grade Hotel Industry on Indoor Air Quality. Energy Vortex. Retrieved on November 14th, 2013 from http://www.energyvortex.com/pages/headlinedetails.cfm?id=2156&archive=1 .